Butanol production from agricultural residues is the most promising alternative for fossil fuels. To reach the economic viability of biobutanol production, both glucose and xylose should be utilized and converted into butanol. Here, we engineered a dual-operon-based synthetic pathway in the genome of E. coli MG1655 to produce n-butanol using CRISPR/Cas9 technology. Further deletion of competing pathway followed by fed-batch cultivation of the engineered strain in a bioreactor with glucose-containing complex medium yielded 5.4 g/L n-butanol along with pyruvate as major co-product, indicating a redox imbalance. 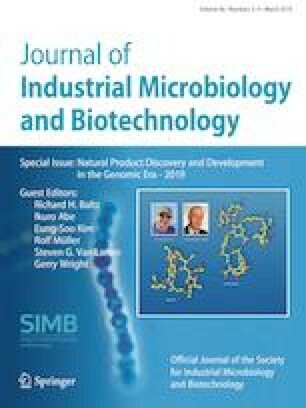 To ferment xylose into butanol in redox-balanced manner, we selected SSK42, an ethanologenic E. coli strain engineered and evolved in our laboratory to produce ethanol from xylose, for integrating synthetic butanol cassette in its genome via CRISPR/Cas9 after deleting the gene responsible for endogenous ethanol production. The engineered plasmid- and marker-free strain, ASA02, produced 4.32 g/L butanol in fed-batch fermentation in completely defined AM1–xylose medium. Equal contribution: Ali Samy Abdelaal and Kamran Jawed. The online version of this article ( https://doi.org/10.1007/s10295-019-02180-8) contains supplementary material, which is available to authorized users. The authors thank Prof. Ramon Gonzalez for providing E. coli LA07 strain. ASA is a recipient of Arturo Falaschi Postdoctoral Fellowship from ICGEB and KJ is a recipient of Research Fellowship from CSIR. KJ, ASA and SSY designed the study. ASA and KJ executed all the experiments. ASA, KJ and SSY analyzed all the data. SSY, ASA and KJ wrote the manuscript. All authors read and approved the final manuscript. This study was funded by Department of Biotechnology, Government of India, via Grant no. BT/PR/Centre/03/2011.